As mental health service providers, the benefits of practicing gratitude have been on our radar for quite some time. Research tells us taking the time to cultivate a regular practice, gratitude improves sleeping habits, lowers blood pressure, and can significantly increase life satisfaction and a sense of wellbeing. At Telecare, we strive to create a company culture in which gratitude thrives. For most people, the biggest challenge of practicing gratitude is finding the time, so we wanted to find an easy way for our staff and the people we serve to practice wherever they are. What we found was even better: a simple way to practice gratitude and connect with others that also promotes a healing environment. We planted a Gratitude Garden. 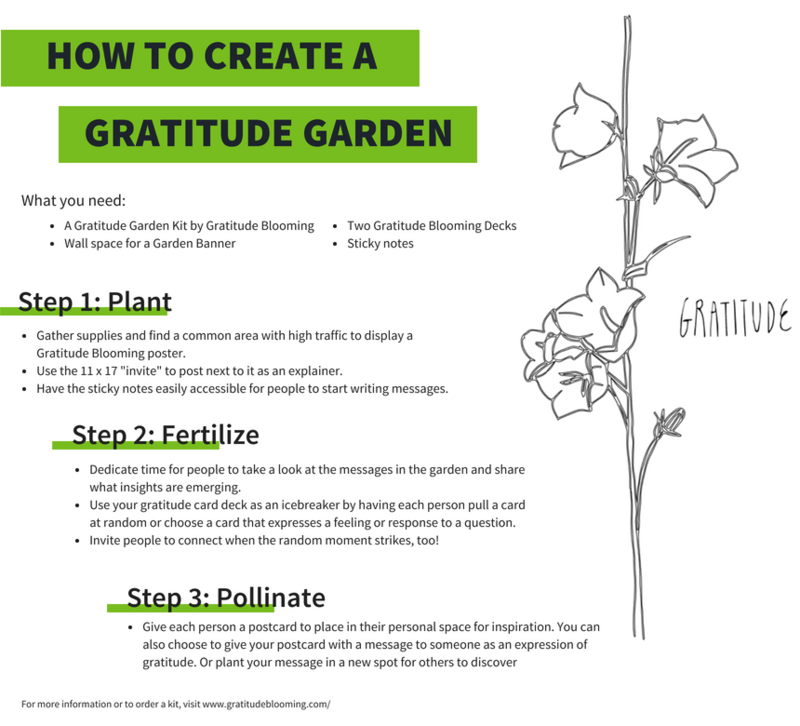 What is a Gratitude Garden? Shannon mong, Director of Innovation Initiatives, found destiny at the solar exclipse in 2017. A few months later, Telecare began piloting a gratitude program based on these cards. Unlike an actual garden, a Gratitude Garden includes far less dirt and worms. 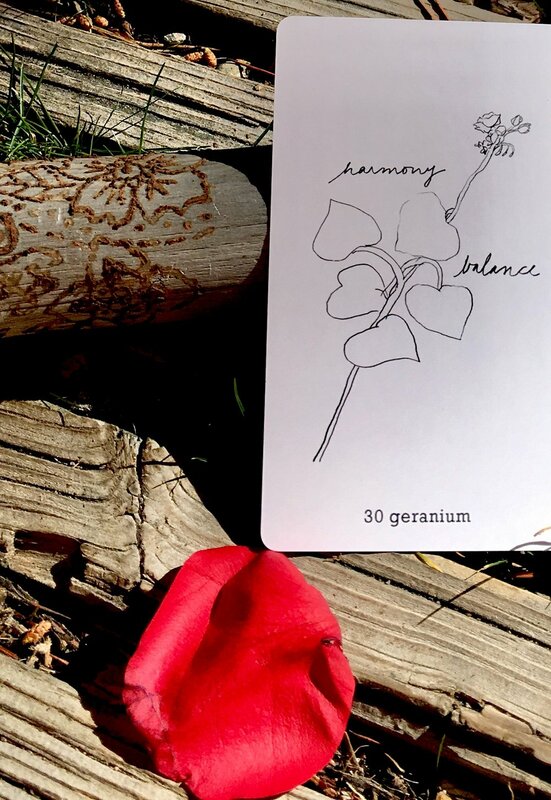 The idea stems from two women who created Gratitude Blooming, a card deck created by them with handwritten themes based in nature to inspire mindful reflection. The founders later expanded their idea to create a Gratitude Garden Kit, "a playful and interactive gratitude experience designed to create inviting spaces for people to contribute their seeds of gratitude and wisdom with the messages they leave behind." Each kit contains a poster and postcards featuring the designs from their card deck with a prompt written on them. So, how did Telecare get involved with Gratitude Blooming? "I was at the solar eclipse last year in Oregon and sat beside people pulling cards from an unusual looking deck," said Shannon Mong, Director of Innovation Initiatives. "I'm a curious person, so I asked what they were. They told me to pull a card, and I got one with a beautiful flower on it and that said destiny. I thought, okay, here we go! I want to learn more." Inspired by the properties gratitude and nature have, Shannon later tracked down the women and learned Gratitude Blooming was based near Telecare's corporate office in the Bay Area – destiny! They met and discussed putting together a gratitude project to engage both employees and clients, breaking down barriers around education or personal experience. Shannon recruited sixteen Telecare leaders to pilot the use of large Gratitude posters at their programs. Each month the program employees and clients plant "seeds" of gratitude by writing and posting reflections in response to a unique prompt on each poster. Our Gratitude Garden pilots at our programs ended in spring. Below is feedback from our programs that implemented a garden at their facility. This July, Telecare's corporate office is planting a "gratitude garden" in Alameda, and in the future, we're excited to continue collaborating with Gratitude Blooming to explore new ways to spread gratitude more deeply throughout the organization. "People who never talk in our group sessions were sharing stories and opening up with their peers. By the end, they were having conversations without the facilitators." – Melissa Planas, Clinical Director at TEIR, a community-based Transition Aged Youth program in Stockton, California. "When we first took the idea to members, the response to ‘gratitude’ was instant: I’m very grateful for Telecare. It was nice to hear for the staff, because it isn’t always verbalized." – Rachel Schwartz, Administrator at Kaiser Downey, a community-based Intensive Recovery Treatment Program in Bellflower, California. "Clients are so happy to fill the posters with messages. One client is really involved and consistently promotes it during community meetings. The clients and staff are more positive, motivated, and engaged with one another." – Jennifer Sevilla, Director of Nursing at Gladman MHRC, a 40-bed Mental Health Rehabilitation Center in Oakland, California. Cordilleras Mental Health Services, Gladman MHRC, La Casa MHRC, Recovery Center at Sarpy, Villa Fairmont MHRC. Jeremy House, Lagos, McMillan Ranch. Gratitude Garden kits vary in the number of items and price and have corporate and community options available.